WinMe, the short name for Microsoft Windows Millennium Edition, sounds less like a PC operating system than a sign posted above a Kewpie doll prize at a carnival booth. Like the prize, WinMe is supposed to go home with you. Microsoft Corp.'s office OS is the more expensive and robust Windows 2000 Professional. Windows Me essentially is a sparingly updated Windows 98, which in turn was a sparingly updated Windows 95. 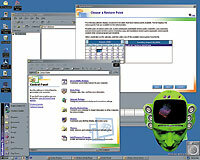 For Windows Me, Microsoft took Win98 and added a couple of features from Win 2000 Pro. Intriguingly, Microsoft threw in some choice tidbits that no other Windows OS currently has. The OS is set for a Sept. 14 release. I reviewed the third beta version of the software. Windows Me has wizards listed in the Control Panel, plus System Restore and other features to keep your PC stable. Windows Me has stronger support than other Windows OS for multimedia, such as .mp3 and .mpeg files. It even has an applet to edit some movie formats, which Win 2000 Pro cannot support. In the Internet-connected world, the use of streaming video and audio makes such applications increasingly necessary. Windows Me has attractions for users who aren't quite ready for the leap to Win 2000. A list of wizards to ease common tasks appears the first time you click on the Control Panel. The System Restore application can roll back your PC to a time when it was performing better. Microsoft has made this feature somewhat adaptive to circumstances. Say you have received several e-mail messages and created a couple of new documents since you installed a trouble-making application. When you run System Restore, the e-mail in your in-box and the documents created recently are not deleted. A System Restore feature would be equally handy in Win 2000 Pro. Like Win 2000, Windows Me protects its core system files against overwriting by other applications. Even Microsoft's own applications cannot write over older versions of themselves. Also like Win 2000, Windows Me has drivers digitally signed for compatibility with the OS. You might already be familiar with the Windows Update feature, which checks the OS and associated files for any needed patches and prompts a user to download them. With user authorization, Windows Me goes right ahead and downloads such patches and updates. Here's the best part: It goes to work when your Internet connection isn't active, and if you begin to surf, it pauses to give you full bandwidth. The download resumes after the connection is again inactive. Windows Me gives you full control when updates are installed and will not install them without permission. If you choose not to install something, you don't have to download it again later because Windows Me hides it for possible future use. Despite the impression that Windows Me is for home users, self-reliant office workers might prefer the new OS because it's easier than Win 2000 Pro and not that different from Win98. The minimum system requirements are similar to those for Win98, too: a 150-MHz or faster Pentium processor, 32M of RAM, a sound card and speakers, a CD-ROM drive and 295M free on the hard drive. For a limited time, Win98 users will be able to upgrade to the new OS for $60; subsequent upgrades will cost $109. New users can buy a full version for $209, and brand-new systems will feature it soon. I like some of WinMe's features and hope Microsoft integrates them into its high-end OSes. Devoted Win98 users might find the new OS is easier to keep stable. Editor's note: Windows Me is one of three new PC OSes to be reviewed by the GCN Lab. A review of Be Inc.'s BeOS 5 appears on Page 25, and next week's Test Drive will examine Corel Linux OS Second Edition.